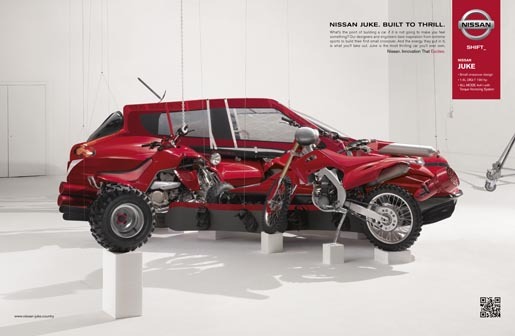 Nissan has launched “Built To Thrill”, an integrated advertising campaign focusing on the inspiration behind the design of the Nissan JUKE crossover car built for men. The campaign brings together original design elements, a dune buggy (originally chosen for its high arched wheel design) and a motorbike (the inspiration for the interior design and console) to build a 3D image of a JUKE. The car seat fabric was inspired by wet suit material. A canoe and snowboard are also featured to appeal to Nissan JUKE’s target audience who seek excitement and fun in the city. The Built To Thrill campaign was developed at TBWA\G1, Paris, TBWA London, TBWA\Else, Paris, by creative director Alasdhair MacGregor-Hastie, creative team Fabio Abram & Braulio Kuwabara, account managers Ewan Veitch, Celina Eude, Eva Gotteland, Thien-Huong Pham, Gaelle Guillou, agency producer (TV) Maxime Boiron, working with Nissan Europe marketing team Bruno Mattucci, Arnaud Charpentier, Timothée Gazeau, Thomas Rodier, Elena Karpenko. Filming was shot by director Lieven Van Baelen via Henry De Czar with director of photography Nicolas Karakatsanis, executive producer Jean Ozannat and line producer Louis Saint Calbre. Visual effects were produced at Mikros Image by executive producer Jean-Lin Roig, producer Christophe Huchet, VFX supervisor Antoine Carlon, VFX shoot supervisors Antoine Carlon and Laurent Creusot, head of 3D studio (commercials) Julien Meesters. Sound was produced by Benoit Dunaigre at TBWA\Else. Music, “The Kraken”, was composed and performed by The Horrors, represented by Chrysalis, Beggars / XL. The print campaign was produced by art buyers/producers Louise Cripps, Claire Delafons and Trudy Waldron, photographer Luke Kirwan, set designers Lyndsay Milne and Andy Knight.